What’s a resort without shuffleboard? 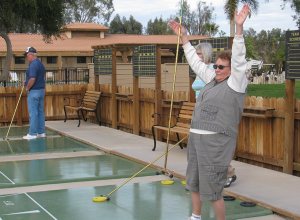 Rio Bend has turned this relaxing pastime into an art form with four beautifully maintained outdoor shuffle board courts adjacent to our pool and spa. Relax and enjoy our poly-diamond refinished courts with a glossy smooth, perfectly level surface. There is also an indoor shuffleboard table in the Game Room.